We know the refrain that’s about to echo through the comments: “just announce it already.” And we agree. It’s looking likely that the June 12 date from our previous leak isn’t going to pan out, but fear not, for there are new dates to bandy about. First is a date courtesy of Synnex, which is looking a June 22 etsimated time of arrival for both the 16GB and 32GB of the TouchPad. Synnex, an enterprise vendor with a lot of HP products in their catalog, lists the tablet as retailing for $499.99 and $599.99, in line with the pricing for the iPad and in line with our own expectations. Amazon, on the other hand, thinks later. 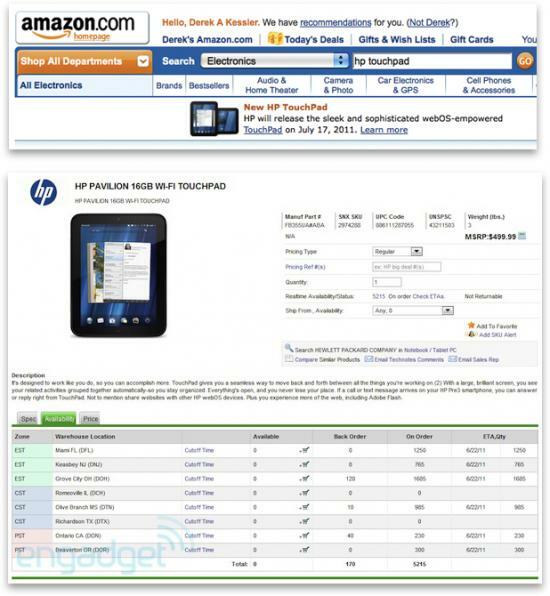 In banners that appear on the site when you search for HP TouchPad or webOS, the online mega retailer is anticipating a July 17th for the “sleek and sophisticated webOS-empowered” tablet. If there we had to pick one source of the two, we’d put out money on Synnex, and say that Amazon’s banners are in error (and not supposed to be showing a date at all). And that’s not because we want the TouchPad to come sooner rather than later (although we do), but because all signs are pointing towards an imminent launch. Source: Engadget, Amazon; Thanks to anonymous and Mark for the tips!